It was recently announced that South Africa is in a technical recession, and although it sounds daunting to buy a house during a recession, it might be the perfect time to do so. South Africa has come out of a technical recession with the economy growing by 2.2% in the third quarter of 2018, said Statistics South Africa (Stats SA). Nedbank has partnered with the Free Market Foundation’s Khaya Lam Land Reform Project to help enable hundreds of families to go from being tenants to homeowners through the transfer of title deeds. 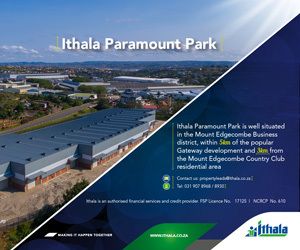 [28 September 2018] Park Square, uMhlanga’s newest business and lifestyle development is due to open its doors in November 2018. Interfacing beautifully with its surrounds, the development offers a future-forward, people-centred destination where the surrounding communities and professionals can shop, work and connect. Rapid technological advancements have gifted people with the ability to redefine their work lives. Loftus Park, the dynamic new mixed-use green precinct in Pretoria, celebrated its much-anticipated official opening today. uMhlanga’s most significant new commercial and retail development is just seven months away from opening.